Twice abbot of St Albans (1420-1440, 1451-1465), John de Whethamstede called his four-volume compendium of history and classical literature the 'Granarium', a play on his name ('Wheathamstead') and on the 'kernels' of knowledge arranged alphabetically within it. Accused of neglecting his job because he spent so much time in pursuit of his studies and funds to beautify the monastery, he based his massive compendium on classical authors and the 14th-century Italian writer Boccaccio. He was the first English author to write a history in a humanist style, although he shaped the mythological content to a moralising Christian purpose. 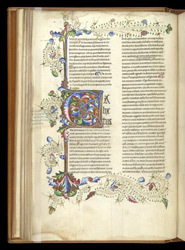 The manuscript's pages resemble a luxurious dictionary, with their beautifully decorated initial letters. Many of the entries concern early Christian figures. Here the stories of the exciting life of St Calixtus (Calixtus I) a 3rd-century pope and martyr are told.